Cardinal Scale Echelon EH series floor scales provide exceptional performance in light industrial and NTEP applications for warehouses, logistics operations, processing plants, and shipping/receiving departments. Ideally suited for pallet and package weighing, the Echelon checkered carbon steel deck tread plate with powder coat paint handles rugged industrial weighing use. Cardinal Scale Manufacturing Echelon EH floor scales provide outstanding performance in basic weighing and NTEP legal for trade applications for environments like a warehouse, logistics company or shipping and receiving departments. 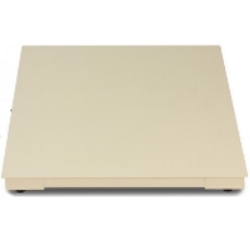 These platform scales are ideally suited for weighing pallets or drums. The Echelon’s checkered carbon steel deck tread-plate with powder-coat paint handles rugged industrial weighing use. The EH series features 4-ft-square platforms, 5,000 lb x 1 lb and 10,000 lb x 2 lb capacities, NTEP and FM-approved IP67 waterproof anti-corrosion shear beam load cells, 3/16”-thick checkered steel deck, 2.2-in/5.6-cm diameter rubber feet, and durable structural steel channel. If you've done any shopping around online or you've contacted a few scale companies then chances are you've come across scales in all different price ranges. There are industrial floor scales that are several thousand dollars and there are sellers online who are peddling cheap floor scales on auction websites which cost virtually nothing. There are definitely situations where a high quality floor scale makes perfect sense. One example might be if you're weighing heavy duty coils of steel. Or perhaps you're a metal recycler and you're weighing all the copper or aluminum that your customers are bring to you and then giving them money based on how many pounds of material they sell to you. In those examples, you want a high quality NTEP legal for trade floor scale that you can trust to be reliable and accurate. Of course, many times the floor scales that you see which are really cheap have no true manufacturer of record. Maybe that's because no reputable company wants to put their name on it? 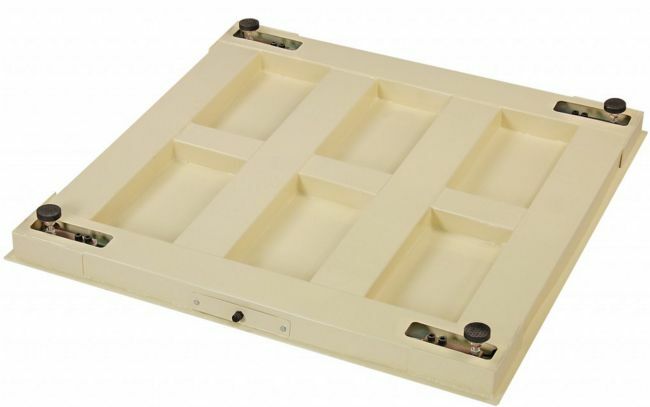 You see many of the low cost pallet scales that you find while you're browsing the internet typically have cheap components inside like load cells, summing boards, and digital indicators. All of these components are part of what makes up an industrial floor scale. So if any of those components is less than ideal, you save money during your purchase but what does it cost you in the long run? Are those generic load cells as good of quality as the brand name version that come out of a ISO factory? Is the digital weight indicator as easy to setup or program as a Cardinal 180? What good is it to buy a cheap scale if you can't read the instruction manual? This is a fair question since many of the low cost instruments that others offer ship in from China with a manual that is written in poor English. The good news is that you have choices when it comes to low cost floor scales. What if you could purchase a low cost industrial floor scale that had brand name quality behind it but without the high price tag? Well, Cardinal Scale's Echelon EH series floor scales are built strong to provide long-lasting and accurate industrial, warehousing, and logistics weighing. The Echelon's nickel-plated alloy steel IP67 shear beam load cells are NTEP legal for trade and FM approved for high accuracy and reliability. The waterproof anti-corrosion load cells are recessed within steel channels containing conduit to deter rodent damage and help protect components from rough handling. The nickel-plated alloy steel load cell feet are height adjustable for 4 inches to 5.5 inches overall scale height. The Echelon floor scale has fully adjustable, rigid rubber feet to accommodate weighing on uneven surfaces. The scale's load cell feet swivel to find level ground, 2.2-inch (5.6-cm) diameter rubber feet. The floor scale's side-access junction box and internal wiring is fully protected from forklifts and rough handling. While these EH Series floor scales are value-priced, the Echelon utilizes a ruggedly-built design and durable structural steel channel to offer efficient installation and operation for heavy-duty use. All internal components are highly protected against fork trucks and other industrial abuse by the 3/16"-thick checkered steel deck protection. You're probably wondering how much this Cardinal floor scale costs? The EH Series is priced a little different than the standard floor scale system that you might find on the internet. The EH floor scales are offered using volume pricing with price breaks at 1-4, 5-9, and 10 or more purchased at a time. Contact us at (919) 776-7737 for more details.